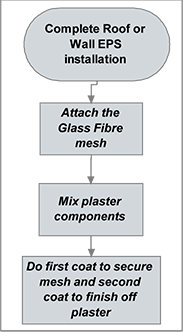 The Acrylic Plaster and Mesh system is easy to prepare and can be applied to all EPS insulation and masonry substrates. 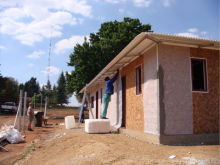 Drape the Fibre mesh on the ceiling or wall and fix flat with staples or flat headed nails. Firstly take 50% of the polymer liquid and add it to a mixing dish. Slowly add 50% of the dry plaster power and let it soak before mixing it in. Any quantities can be mixed, but at the 4:1 ratio only (w/w) Mix in thoroughly to a smooth consistency breaking up all the lumps. Apply sparingly to the draped mesh using a steel plaster trowel ensuring no creases form in the mesh and work towards an even spread of pre-plaster without coating the fibre strands completely. Let dry for approximately 30 minute or until you can touch the first coat. Then do a second final rendering, coating all the fibres strands to form a smooth 3mm coating.